To add to its outdoor sculpture display, Haddonfield has acquired a sculpture by an artist whose work has been blessed by the pope. The Haddonfield Outdoor Sculpture Trust has installed a new sculpture outside Republic Bank, 30 Kings Highway East, called “Europa” by Philadelphia artist Joshua Koffman. The pope blessed a work of Koffman’s during his visit to Philadelphia last September. An unveiling and reception was held at the bank on Tuesday, May 31. “I think we’re very fortunate to have such a classical art piece in town,” HOST chair Stuart Harting said. On Sept. 27, 2015, Pope Francis made a surprise stop at Saint Joseph’s University to bless the statue, “Synagoga and Ecclesia in Our Time” by Koffman. The bronze work was installed Sept. 25 at the plaza in front of the Chapel of St. Joseph-Michael J. Smith, S.J. Memorial, commemorating the 50th anniversary of Nostra Aetate, the Vatican II document that transformed the relationship between the Catholic and Jewish faiths. The statue shows two figures representing the church and synagogue studying together as equals. Since his work being blessed, Koffman has had requests for replicas from Europe, according to Harting. Upon hearing about the blessing, Harting reached out to Koffman to see if he had any works that could be displayed as part of Haddonfield’s public/private outdoor art initiative. The piece he offered was “Europa,” as it just came back from display elsewhere. Koffman is a Philadelphia-based sculptor known for his expressive and dramatic large-scale bronze sculptures. 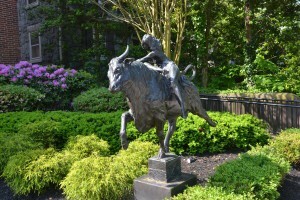 “Europa” is a bronze statue of a young woman riding on the back of a bull in motion. Koffman’s work is often inspired by mythology and how the story can relate to what is happening today. For “Europa,” Koffman was inspired by the story of Europa, where she was abducted by Zeus and also became the first queen of Crete. Koffman used that as inspiration and, instead of being abducted, Koffman says he sees it as Europa taking control, as being a queen she had to be a strong woman. Koffman said he is honored to have his statue in Haddonfield and to expand his work outside of Philadelphia. He also hopes that those who see his work get intrigued by it, come closer to look at its beauty, along with the other sculptures in Haddonfield, and think about the story behind it. “That is kind of my goal, engaging people, making them think and experiencing beauty,” Koffman said. Republic Bank held an unveiling with the artist, Harting and other important Haddonfield locals on May 31. “I’m very grateful for Republic Bank’s strong cooperation and commitment to the arts,” Harting said. “We’re thrilled to partner with HOST and have rotating pieces of art in our garden, adding value to our community. We’re looking forward to continuing this partnership in the future,” Senior Vice President New Jersey Marketing Manager Robert B. Worley said. “Europa” is one of eight rotating pieces in Haddonfield, and one of 16 outdoor artworks in total. According to Harting, the piece will be on display for a year, as HOST tries to rotate its outdoor displays to keep things fresh and interesting. Harting hopes people stop to check out the piece, as well as the other artwork around town. “I hope they stop and look at it and appreciate outdoor art … When people walk down the street, I watch them and see them smile when they see (the sculptures). Kids love them,” Harting said. HOST is a nonprofit organization that has made a commitment to “transform this walkable, attractive and historically significant borough into a significant center for juried outdoor sculpture in the great tradition of public art,” according to its website. For all of its hard work, HOST was honored with a proclamation and Community Award from Camden County last April. HOST is looking for interested buyers of the sculptures on display as well as submissions from artists for outdoor work. To get in contact with HOST or to donate to the organization, visit its website at www.haddonfieldsculpture.com. Editor’s Note: The following article reflects some changes since the unveiling.